I’m trying out a diet that is friendly to acid reflux and tried out the “OMG Banana Oatmeal Pancakes” recipe from this book on eating less acid foods in support of acid reflux. Combine the first six ingredients, then the liquids into the dry, mix, fry and serve. 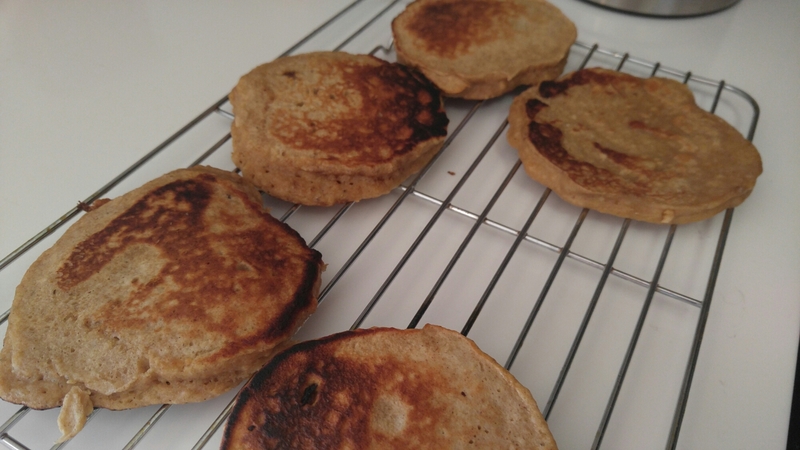 I didn’t have oat flour (so I used whole wheat flour), sour cream or buttermilk (so I used Greek yogurt). I also used two bananas since my bananas were huge. The outcome was good, but I’d definitely use oat flour next time as whole wheat has very strong grainy flavor which I can’t blame this recipe for. I didn’t see this note at the bottom of the recipe in time, but you can make your own oat flour by processing oats.